What are the key factors affecting children's health in India? 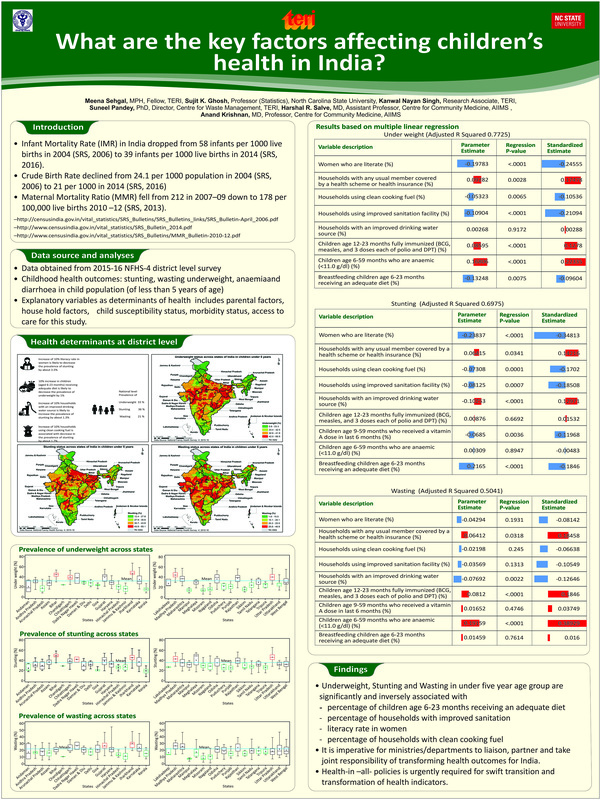 The poster was presented at Global Environmental Health Day 2017 Global Community Empowerment Through Community- Engaged Research Friday; September 15, 2017; NIEHS Building 101; Research Triangle Park; North Carolina, USA. The health indicators like infant mortality rate, crude death ratio and maternal mortality ratio have improved in India. But there is still high prevalence of malnutrition in India with low health status in children. Thus, the present study looked at the factors affecting the health of children in India. The data from NFHS-4 for childhood health outcomes was used. The determinants of health included parental factors, household factors, child susceptibility status, morbidity status and access to care. The results showed that the prevalence of undernutrition, stunting and wasting in children under five years of age is inversely associated with percentage of households with improved sanitation, with clean cooking fuel and literacy rate in women. Therefore, health- in- all- policies is urgently required for swift transition and transformation of health indicators.